My 8 year old son LOVES to play catch with the football....for hours! Unfortunately, I don't always have the time to play for hours on end with him. So this year I am so excited to give him the Passback Football which will not only allow him to play catch longer by himself but it also helps him work on his grip and strength! Kids will never say “I’m bored” or “I don’t have anyone to play with” when they unwrap a Passback Football this holiday season. From the Pee Wee Passback Foam Football ($14.95) to the Official Passback Composite Size ($34.95) boys and girls will eagerly head outdoors or down to the basement for a cardio workout that’s fun with or without a playmate. Until now, the game of football was never a sport a kid could play by himself. Thanks to Passback Sports, every one of their footballs is a one-of-a-kind training tool that is thrown like a regulation ball but engineered to hit a surface and come spiraling back. Aim the flat side of the ball to any wall surface and be amazed as it boomerangs back to the person who threw it. It’s just like having the perfect practice partner when no one is around! And I love that they offer three different sizes so all ages can play! We got the youth size for my son so that he can play with it for many more years to come! 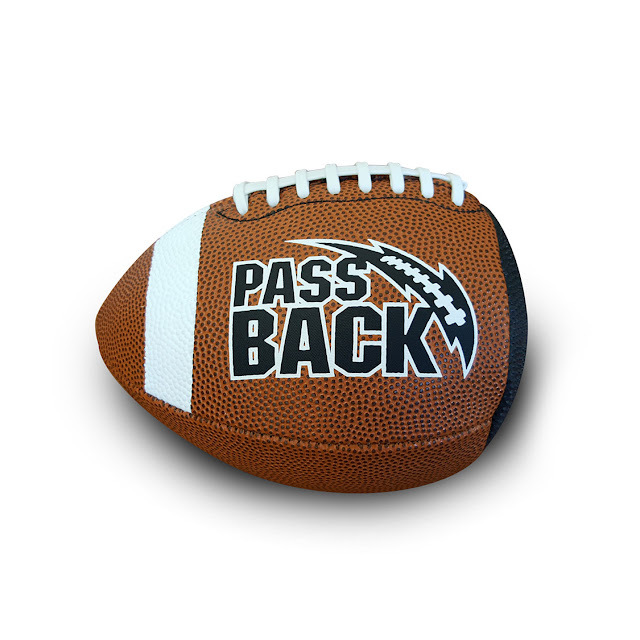 The Passback Rubber Youth Size Football training aid is perfect for youth ( Ages 9-13) and pee wee football players looking to learn how to throw and catch a football while improving reaction time. The smaller size and rubber material makes it easier for them to learn throwing fundamentals and increase hand-eye coordination.